Inventory of scarves is done! It was a big weekend for inventory and a new piece in the studio. I have over 100 silk scarves and yardage for the Michigan Fest! Really looking forward to the next week–I need to make my display, pack and create contact cards! What have I been doing this week? 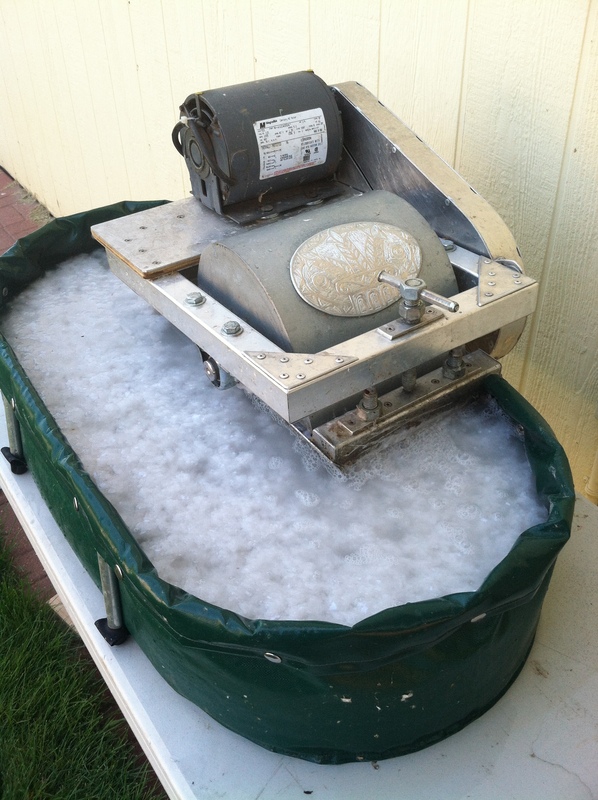 In addition to obsessively dyeing scarves, I used this machine to make abaca and cotton paper pulp! Such an awesome tool! However, once the pulp is made, the human work begins. Pulling sheets, pressing them, drying them–hours of physical work and I am POOPED! But I do have about 100 sheets of awesome paper to show for all of it! My website is in process! I am retooling it so it reflects the bodies of work–and thought–I am building today. Yes, I know that a website should be more than just a repository of images or ideas…but this is the way I have used mine until now. In October 2013, I was blessed with an opportunity to take a position at Bismarck State College. I left service at St. Alexius after 6 years and many good memories. It was a tough transition, a necessary change, and my new job description includes…SUMMERS OFF! WOW! So, for the first time in a good number of years, my days are my own and I am making new work like crazy. I also decided to apply for an artist’s booth at the Michigan Womyn’s Music Festival, August 3-10. I am concentrating on two areas of work right now: hand-patterned silk and copper/brass inspiration medals. the Contact Me! tab will have a form for you to use, should you wish to reach out. Because I am an artist and NOT a web designer, I think it could take a few weeks to get all this accomplished, so thank you in advance for you patience! It will be worth it–I am really proud of my new work and so ready for you to see it. I had a “god-moment” a bit ago. I haven’t worked on my website since June and dropped by to read through my last post. It was full of angst over my job, longing for change and realization of the value of art in my life. I re-read my own words, understanding again what a long, long road this position has been for me. I now know the job itself will be ending–not sure when, but it is slated for elimination–so the grieving can begin in earnest. The words I wrote two months ago are a gift to me now. Then I realized…my last two posts were written on the 11th day of those months, too. My eyes, ears, heart and spirit aligned in that moment. I am going to write frankly here because–frankly–there are very few people who may ever read this blog. Those of you who know me have heard my misery over my job. Many of you have made the same decision in your work lives: changing direction toward the unknown based–frankly–on more money and prestige. Perhaps you even had become disillusioned with your old job and had begun the search. When the promotion was offered, you jumped at the chance to report directly to a vice president, or whatever perk took you to that place of unknown. Even though your kind-hearted and protective boss warned you–told you not to take it, basically–you did it anyway, thinking you’d make the best of any challenge. My purpose here is not to bad-mouth my particular job, but to connect with the idea of hoping for the best, fearing the worst and forging ahead, despite dire warnings from others. Riding a wave of enthusiasm, good intentions and not a small bit of hubris, I took the job. And for weeks I’ve fumbled around, given voice to my distress…. Until that “one true thing” pushed its way in. It made me realize that I’ve spent enough time convincing myself that my job is viable for me and enough time boring people with my angst. It happened last night. At the grand opening of a little community clay cooperative. That little moment occurred on the potters’ wheel. And for some unbelievable reason, a friend captured me in a photo–frankly–at the moment the “one true thing” happened! She said I made the whole thing look so easy, and it was. In that moment I was aligned–body, mind, emotion, spirit. I don’t have words for it…it is a feeling. A very quiet, still, assured, peaceful knowing. Its like all of a sudden I understood my place in the world. While it could be connected with the clay, I feel it other times, too. It is a usefulness and a blossoming all at the same time. It is a time-out from the regular urging of time, yet it only takes an instant. I knew there was something more intended for me than the politics and stress and endless searching for approval! Let’s see: when else have I experienced this “one true thing?” Hmmm, when watching a video I took of my own hands forming clay into a turtle. When I thought about the actions of tying a scarf into patterns for dying. There may be more, but I don’t want to force it. I just want to notice when it happens. In that moment, I could be fully me without anyone being diminished. I didn’t have anything to prove, I could just be. I might spend some time analyzing it to what brings it on, but perhaps I will just notice it. Here’s the thing: I know it has to be connected with God. I have been in so much turmoil and so sad. I’ve been praying for relief and to know my direction. I’ve wanted to know how to get off of the people-pleasing cycle. I’ve wanted to just be and just be okay with that. If I’d made a list of important things, I could have written my way around it, probably thinking it was my creativity, my teaching, my drive to connect with other humans. None of those descriptions fully fit this because it is so visceral. My artistic intent for 2012-2013 was to create light-hearted work. I saw it as an opportunity to explore a variety of media and make some decisions on artistic direction. Then my life happened: unresolved conflict with my daughter-in-law, painful separation from my son, a new position at work that’s rife with political difficulty, my father entering hospice, and on-going relationship work with my husband. Since childhood, making stuff has been the way I released stress and helped myself feel better. I create a tangible object over which I have control: I can mold it into something positive, beautiful. It is a way that I prove—to myself—that I am still o.k. The colors, the pattern, the materials speak to me in a calming way, connecting me to spirit, the creation and God. When times get bad, I can submerse myself in my artwork and feel balance again. I am so thankful for this gift. To digress a bit…when my ex-husband died, I took a major artistic departure. I’d been a costume designer for a number of years, while creating and selling original art-to-wear on the side. After Jeevan’s death, this area of exploration was too painful to continue, so I stopped creating clothing in favor of other areas. I took my work different directions—collage, mosaic, tiles, encaustic, and jewelry. Each of these media allows me to indulge in rich varieties of materials, mixing them to suit my emotional state. My jewelry work, though, serves another function. During these difficult times, I’ve turned to art-jewelry-to-wear as emotional armor. In the midst of a terrible time, I can sit down with mixed media supplies and create pieces to express my situation or affirm my person. I can wear it as affirmation and protection. This taps into a long human tradition of the worn talisman, interpreted for my needs today. In June, I thought I would be featuring a different medium roughly every month, creating an online teaching module for each, perhaps attracting students to this online academy, and it would keep me on target. I am, after all, a teacher and people-pleaser by nature! I envisioned a highly interactive and creative time period. Life had a different plan. As I fell apart emotionally, I turned to creativity. My good old friend was there for me as always! I could retreat into color, texture, pattern, materials, form and beauty for a while. I’d emerge with finished piece, a testimonial to my survival and a thread of hope for the future. I dove in deeply and came up from the bottom of this ocean with treasures—some painfully jagged, others placid like calm seas after a storm. The pieces I created are not balanced across the media I use, nor do they represent the total number of areas in which I work as an artist. Most are jewelry, talismans created to help me get through the very rough days. Because most are 3-D, they are better viewed in person. But as all contemporary artists know, our work will be seen first in digital media. The twelve works are represented by a product and a detail shot, a brief description, and some are included in video as well. …now if I can only let go. This entry was posted on May 11, 2013, in artistic direction. I am starting from scratch, remaking my website to better reflect my status as an independent artist. Check back soon for images and process details! This entry was posted on February 3, 2013, in Uncategorized.